Imagine the scene – our protagonist is sitting on a bar stool. One elbow leans on the countertop; a glass is in their hand. Time stands still as we watch a droplet of condensation slowly meander its way down the glass’ stem. Someone approaches. Maybe they order a drink too and we witness the bartender put on their flair, presenting a flamboyant cocktail with effortless style. Maybe the atmosphere is convivial with background chatter, laughter and the clink of glasses. Or perhaps it is tense. A clock ticking on the wall. Silence shattered only by the sudden sound of breaking glass. The drink itself may play an important role. Does our character have a signature serve? What does it tell us if they order a Martini rather than a Gin and Tonic? The focus may shift away from the drink entirely. Dialogue may be introduced, leaving the bar and its intricate details merely part of the scenery. A backdrop rather than a focal point. How we write about gin both consciously and subconsciously influences our readers. A lot can be learnt from reading between the lines. We can gather personality traits and a character’s habits through their drink choices. What a character drinks needs to relate to the situation, to the mood and to the reader’s empathy. Throughout history gin has found its voice through literature. Whether this be as condemnation in the 1700s anti-‘Gin Craze’ pamphlets, as product reviews on all our drinks blogs or as the tipple of choice for our favourite fictional character. With more and more people writing about gin, it’s time to reflect on some of its most successful and lasting appearances in fiction. In 1953, Ian Fleming published his first James Bond novel, Casino Royale. 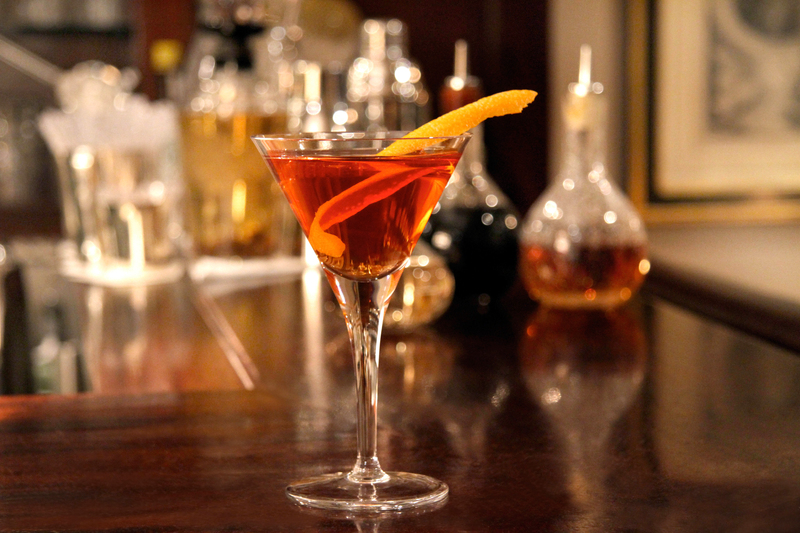 The character’s iconic cocktail, a ‘Vesper Martini’ has become one of the most famous drinks in fiction. Fleming fixes an identity to the drink, simultaneously infusing it with sophistication and a sense of occasion, as well as positioning it as the character’s leitmotif. The Vesper Martini is elevated from stage prop to integral role. ‘Three measures of Gordon’s, one of vodka, half a measure of Kina Lillet. Shake it very well until it’s ice-cold, then add a large thin slice of lemon peel. Got it?’ Bond’s knowledge and his expectation for perfection add to both his own character portrayal and that of the drink. The two become inseparable, one and the same. The popularity of Fleming’s James Bond novels has stood the test of time. Fans can create a modern version of the drink at home, paying homage to their idol and enjoying the association it affords them. Recent events have tried to source original Kina Lillet to recreate the cocktail in its true fashion. 1953 was the year for adding cocktails to your writing. Raymond Chandler published his sixth novel featuring Detective Philip Marlowe, The Long Goodbye. ‘A real Gimlet is half gin and half Rose’s Lime Juice and nothing else. It beats Martinis hollow.’ This quote, uttered by the alcoholic character Terry Lennox, moves the link between characterisation and author personality to another level. The drink an author chooses to serve their character reflects their own habits and foibles. The Long Goodbye has been lauded by some and criticised by others, but none can dispute the profound themes which crossed from Chandler’s own life straight into the pages of his books. Chandler became an author who transposed himself into his characters. An alcoholic himself and writing at a time when his wife was terminally ill, he created relatable tragic characters by being one. Tellingly, the emphasis again on the character describing the exact manner to make their preferred drink shows the importance gin played in society at the time and in the author’s own life. How gin is portrayed in literature is not the only aspect to consider. When the words were written can give us incredible insight into their true meaning and the author’s intentions. Charles Dickens wrote during the 19th century, at a time when gin palaces were flourishing in their opulence, whilst the population was dying of depravity. He depicted the gin shops in all their glory, ‘All is light and brilliancy.’ His descriptions are vital for us today, giving us a sense of time, place and compassion. ‘…The gay building with the fantastically ornamented parapet, the illuminated clock, the plate-glass windows surrounded by stucco rosettes…’ From a historical perspective, these eloquent accounts provide us with fantastic reference points. From a drink perspective, we can witness first-hand how it felt to step into a gin palace at the height of gin’s popularity. We can relive the experience vicariously and adapt elements to create functions and events for our current gin-craze. ‘Gin-drinking is a great vice in England, but wretchedness and dirt are a greater; and until you improve the homes of the poor, or persuade a half-famished wretch not to seek relief in the temporary oblivion of his own misery… gin-shops will increase in number and splendour.’ Famous during his lifetime, it is poignant that Dickens may have felt a sense of social responsibility to highlight the truth about the poor. His words were listened to, his stature within society respected. His voice carried a generation and an era. With instant access to immeasurable updates and statistics, true written accounts with heartfelt opinions and reflections on our surrounding society and its impacts could easily be lost. What Dickens wrote as his truth has become an important resource for us understanding the past. How will we look back on our modern Gin Craze in years to come? Which details and accounts will inspire the next generation, giving an accurate portrayal of our time? Bridging the gap between fictional reference and modern-day gin is Victory Gin. Nineteen Eighty-Four, George Orwell’s iconic dystopian novel sees protagonist Winston Smith struggle with his independent conscious thoughts and feelings against the oppressive regime. He satiates his anxious mind by numbing it with alcohol, Victory Gin, and cigarettes. The irony lies in the fact that his coping mechanisms and vices have been provided by the same overpowering party he is trying to escape from. Orwell describes Victory Gin as ‘[growing] not less but more horrible with every mouthful he drank… It was gin that sank him into stupor every night, and gin that revived him every morning.’ Even in a negative scenario, gin is placed at the centre of the character’s life. The Chestnut Tree café is an integral setting within the novel. It has its own rhyme with multiple layers of meaning, ‘Under the spreading chestnut tree, I sold you and you sold me. There lie they and here lie we, under the spreading chestnut tree.’ Fortunately, the use of chestnut as a botanical is not purely for fictional cohesion, it adds an attractive savoury, nutty note to the gin, serving its true purpose. It is brilliant to see an avid fan of literature extend their love of words into the real world and into their craft. Next time you find yourself with an elbow on the bar, glass in hand, take a moment to reflect on gin’s colourfully-woven history, its role in literature and what it’s trying to say now. Reflect on the author’s words and on their personal life. As Marcel Proust says, ‘In reality, every reader is, while he is reading, the reader of his own self.’ We can find great joy and comfort by delving into a good book. We can find great sensations and experiences by sipping a good gin.